We connect with animals on many levels, whether walking a dog, riding a horse, observing gorillas at the zoo, playing with a teddy bear as a child, or even simply watching them on TV and in movies. We call our sports teams Wolverines, Bobcats, Grizzlies, and Panthers. We can be gentle as a dove, fierce as a grizzly, or as agile as a cat. Some of us may even dream of being reborn as a different species. We typically accept these connections for what they are, taking for granted what is really a remarkable -- and necessary -- part of our existence. In Ask Now the Beasts, acclaimed nature writer Ruth Rudner explores the eternal and complicated connections between humans and animals.In a series of true stories about her own interactions and observations of some of the many animals that have crossed her path, she writes about the powerful ways that animals interact with us spiritually, activate our imaginations, and tie us to the ancient past. Moving between domestic and wild, Rudner finds meaning and appreciation for the way in which each animal exists fully in its own world -- and how that world relates to ours. The author of these heartwarming essays writes, "All my life I have wondered what it feels like to be a horse." Rudner (A Chorus of Buffalo) has driven for hours to find a homeless dog, lost her heart to a pack mule and fallen in love with a baby gorilla because she believes that connecting with animals, whether domestic or wild, is as important as connecting with people. Rudner cites a passage in the book of Job: "But ask now the Beasts/ And they shall teach thee," and she demonstrates the wisdom of this by telling of the experiences she has had with dogs, cats, coyotes, wolves and other animals, showing how they have changed her life. For example, from her horse she learned to deal with an unfamiliar obstacle in the road--it's difficult at first but in the end "simply a step on a path." By watching a colony of penguins, she learned to accept that death is a fundamental part of life. Her compelling message is that because we share our planet with the animals, it's important to seek connections with them so that we may learn how to live in balance with the natural order of things. Journalist and animal lover Rudner (A Chorus of Buffalo) draws on her newspaper and magazine articles to ruminate on our relationship with animals, showing a great deal of creativity in her astute observations about pets, wildlife, and zoo creatures...Ask Now the Beasts is an enjoyable read that will appeal to general readers. "I have spent my life with animals," writes the author in the introduction to this sensitive and eclectic collection in which past relationships with dogs, horses, cats and birds are discussed and idealized. Rudner writes of wolves silhouetted against the full moon at Yellowstone; reintroducing peregrine falcons to the wild; a coyote "hitchhiking" on a ski trail by Old Faithful Lodge. Domestic animals aren't given short shrift: there's Champ, a handsome sorrel colt with a white diamond blaze; Ace, an agile trail horse; and Lion, the formerly feral tabby...Rudner has some astonishing tales to tell. You don't have to live with dogs or horses, backpack in the wilderness or stay at a raptor center to be totally beguiled by this vivid book. Rudner writes unsentimentally but with true sentiment about a wide variety of creatures--falcons, seals, penguins, coyotes, bears, even gorillas--to say nothing of dogs she has loved to the ends of their lives. Horses are everywhere in these pages, patiently serving in pack trains and under saddle. And they are also at liberty, galloping joyously across their open spaces, pure grace in motion. Pure grace in motion is how I see this fine book. Here are spirited stories from a woman who follows animals with the wise eye of her heart. Rudner speaks for all of us who cherish interspecies kinship: 'It is not anthropomorphizing to fall in love,' she writes. 'It is simply falling in love.' An inspiring and life-giving book. Ruth Rudner is a writer of breathtaking sweep. In these pages, she writes with brilliance and wisdom about what really matters: the connection between people and the rest of animate creation. Whether she is showing us how to pull a string of mules, or how a peregrine falcon brought her the sky, every one of her stories surprises with shocking beauty and timeless truth. I read this book in one sitting, but will continue to think about her words for a very long time. It is not necessarily rare to encompass fact with feeling. But Ruth Rudner encompasses both, and with wisdom...Ask Now the Beasts is a thoroughly engaging read. One of the warmest, most charming, generous, humorous books about animals I have read. Like listening in on a lovely, lively, passionate fireside chat about animals with a wise and kindly and keen observer. 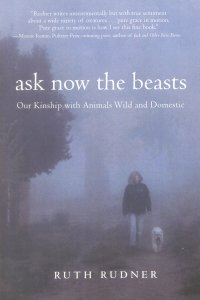 Ask Now the Beasts: Our Kinship with Animals Wild and Domestic by Ruth Rudner is a series of concise but thoughtful reflections on her experiences observing animals. She tells moving stories about the dogs and horses in her life and then moves seamlessly into her interactions with penguins, gorillas, seals and falcons. This book is both emotional and logical. Rudner discusses her feelings and failings with a deep sense of honesty. She writes about animals in a way that shows us how to be a better human. Ruth shows that animals can be a vital part in our development an understanding of the worlds around us.